The comparisons are ubiquitous: Jeju is like Hawaii, pajeon is like pizza, Chuseok is like Thanksgiving. Abundant and familiar to anyone who has spent time in Korea, these analogies flatten out the nuances of reality, drain them of their unique character and rob them of their distinctive character. 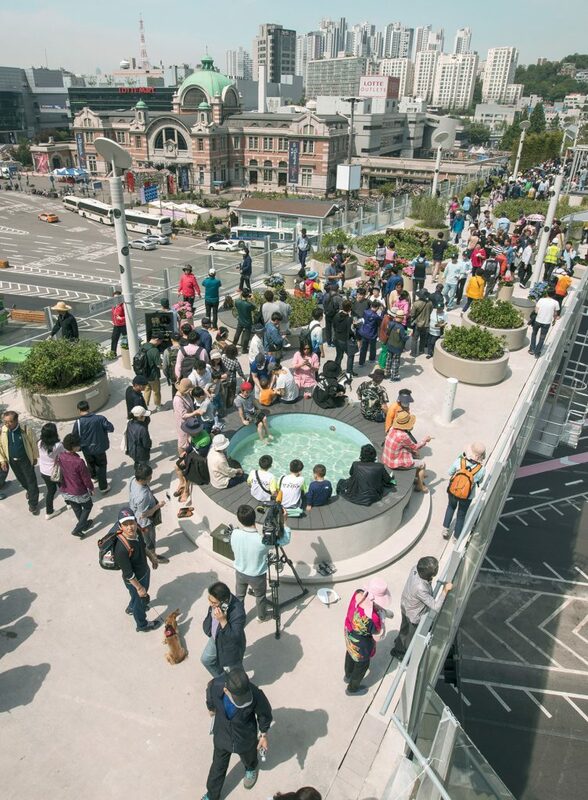 Likewise, as Seoul revels in the global attention of the newly reopened Seoul Station overpass, a project also known as Seoullo 7017, the comparisons to New York’s High Line are pervasive. Nine out of ten articles predictably compare the project to the High Line, an archetype that has siblings in Chicago, Atlanta and even Paris. But despite the obvious similarities, the project is not Asia’s High Line. Instead, it is a path that tells a living history, illustrating the complexities of Seoul’s urban landscape: a city eager to pursue transformation, but quick to dismiss uncomfortable realities. Seoullo 7017 — a name which comes from the construction date of the original structure (1970) and the year it reopened (2017) — is the redesign of a 1.7 kilometer section of flyover near Seoul Station. With ambitious aims to revitalize the surrounding neighborhoods, preserve historic heritage and bring business to local markets, the overpass reopened with great fanfare on May 20, 2017. The elevated road tells the story of Korea’s past, mainly that of the industrial boom which is credited with pulling Korea out of poverty and landing the country a place among global economic giants. It symbolized the growing wealth of the country, and of the capital in particular, as the road led from Seoul to Korea’s outlying provinces. However, safety of the road became an increasing concern and in 2006, the flyover failed a safety assessment. It was clear that something needed to be done with the structure. Until early 2014, the resounding consensus was to demolish it. However, in the spring of that year, the city suggested the possibility of renewal, and after extensive architectural, design, engineering and even community consultations, they launched the renewal project. 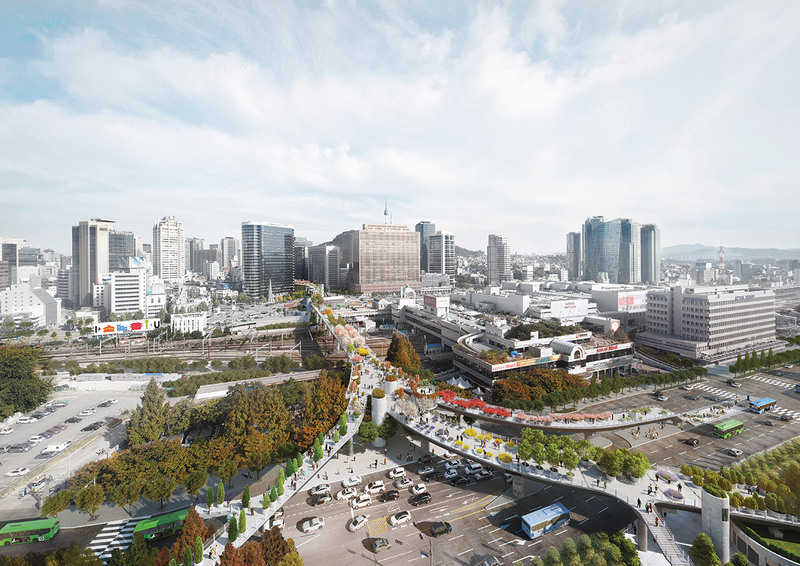 The redesign of Seoul Station Overpass was a decision to not only ensure the security of the thousands of people who passed through the area daily, but also to connect the city in a new way, to prioritize mobility over traffic and to bring life to an area so commonly associated with cement and cars. The decision was also a significant shift from a focus on productivity and efficiency to one of community and open space. 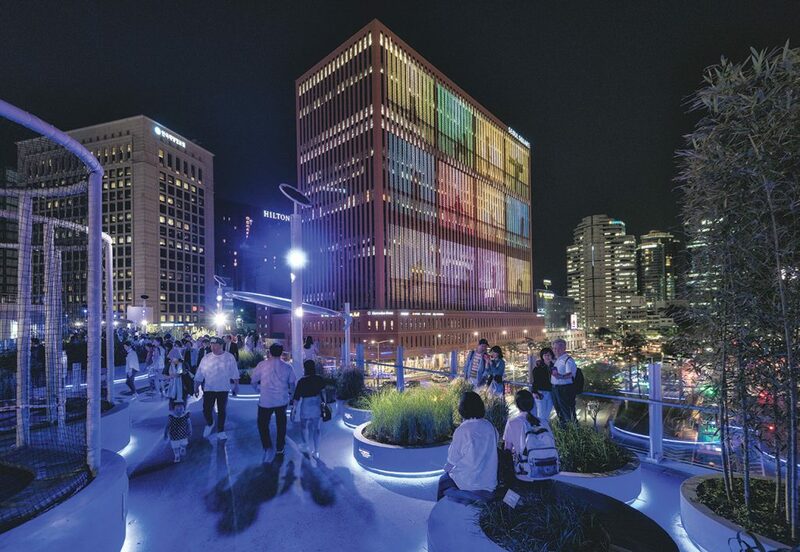 Despite Seoullo 7017 being the most notable and highly publicized project in the area, the neighborhood surrounding Seoul Station is experiencing wide sweeping changes in general, due in large part to revitalization efforts by both the local and national government. 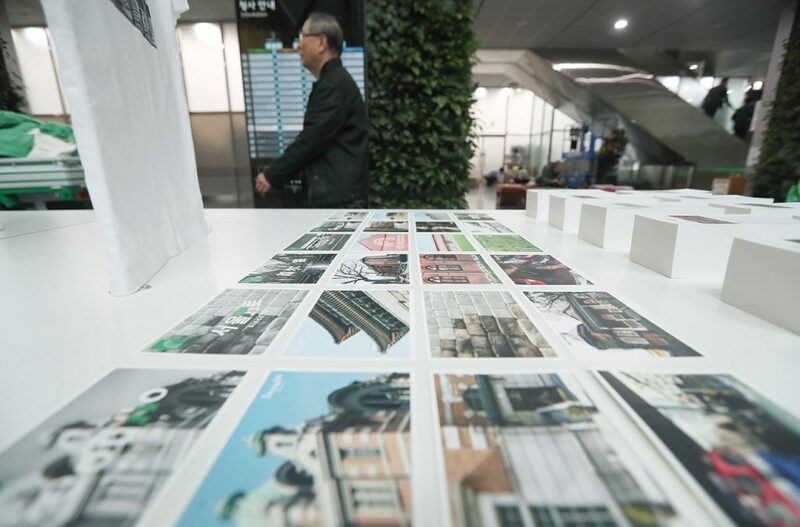 In 2007, the old Seoul Station building — which had been designated as a historical site in 1981 and lost its functionality when the KTX station was built — began restoration under the Ministry of Culture, Sports and Tourism. It reopened in 2011 as a cultural space housing a coffee shop, exhibitions, restaurants and a barber shop. Commercial buildings, stores and restaurants have sprouted up in the neighborhoods surrounding the station, bringing transnational chain stores to a place once known for its vibrant local community and mom and pop storefronts. Seventy-five bus lines and nearly 400,000 people pass through the Seoul Station area every day. But it is the local residents and business owners who are most affected by the upcoming changes. Many have disapproved of the project, protesting the impact of gentrification, arguing that they would lose their businesses and criticizing the project for putting money into an urban eyesore while covering a problem with a nice exterior. Dutch architect and urban planner, Winny Mass of MVRDV Architects, won the 2015 design competition of the overpass project through his “Seoul Arboretum” design. 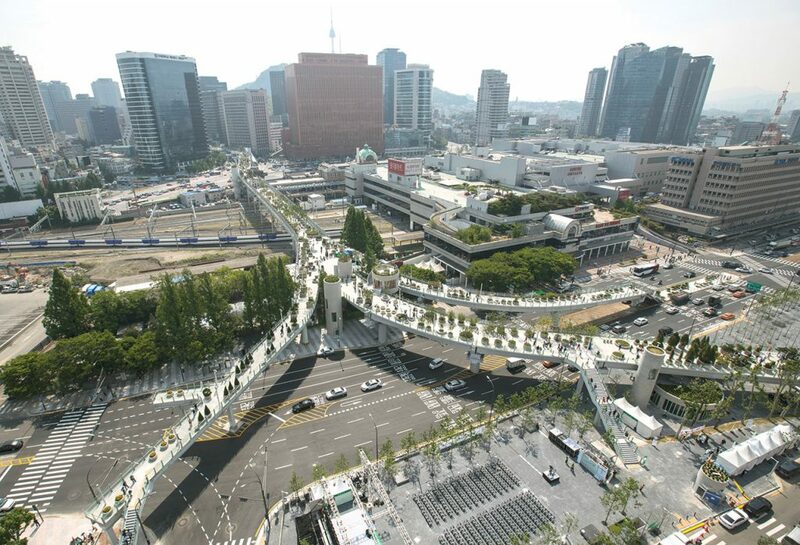 According to MVRDV, “Many viaducts and pedestrian overpasses in Asian cities are purely functional elements, but due to the scale of the Seoul Station Overpass which was built for vehicle traffic, an opportunity exists to create a unique public space in the heart of Seoul.” One of Mass’ aims was to make the space as green as possible, with Korean plants arranged by their order in the Korean alphabet and a vision for an urban nursery that grows plants for the city. Mass also considered one of Seoul’s most challenging urban dilemmas in his design: pollution. The overpasses’ location, 17 meters above another road, is even more prone to pollution as well as noise from traffic. 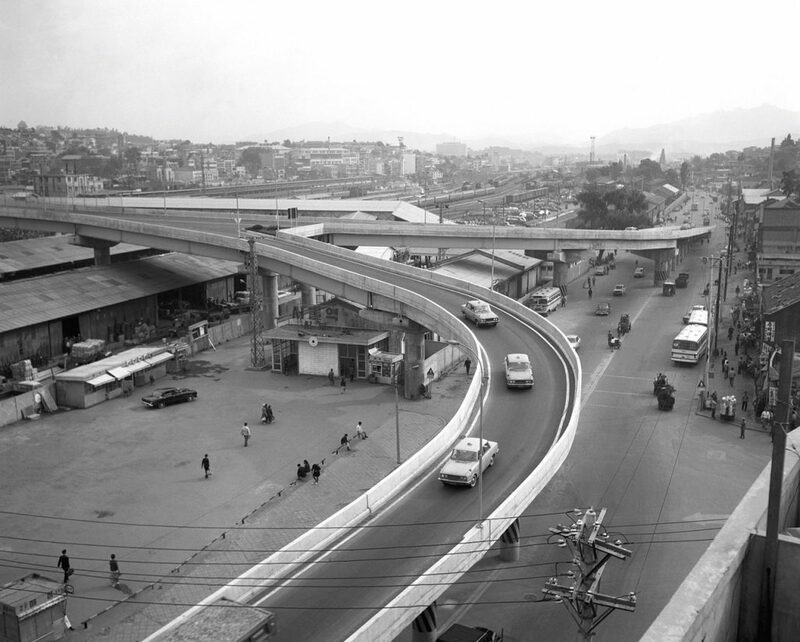 In order to minimize these frustrating aspects of urban life, the architect added design and architectural elements to the sides of the overpass which reduce the amount of pollution that rises from the road and diminish the clamorous sounds of cars and busses. However, since its opening, the overpass has been criticized for its excessive concrete and inability to fulfill its hyped-up promise of green space. Large concrete planters crowd the concrete path which lead to concrete stairs and sidewalks. Visitors can be overwhelmed by the crowds, heat and lack of natural space. Shaded umbrella-like structures have been included in the design, and there are some small fountains, but it remains to be seen whether the 24,000 plants will grow large enough to truly create an urban garden. 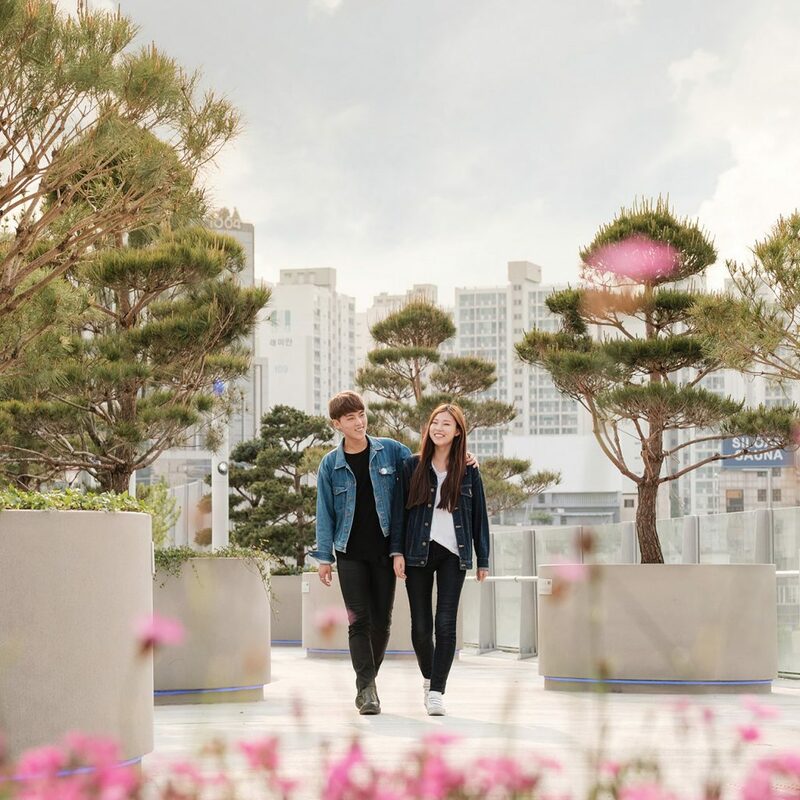 As part of the project, 17 pedestrian walkways have also been built that lead to iconic locations around the city including Namsan and Myeongdong. 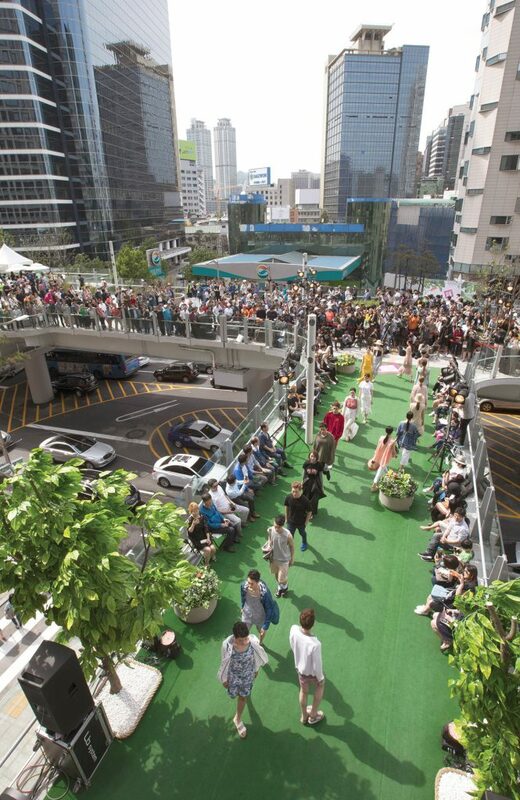 But will the path actually encourage more pedestrians and turn Seoul into a walking city? Ben Jackson commented on the purpose of the project, noting that rather than a giant infrastructure project, “small adjustments or a better, more widespread urban walking scheme” may have fulfilled the goal of encouraging more pedestrians. 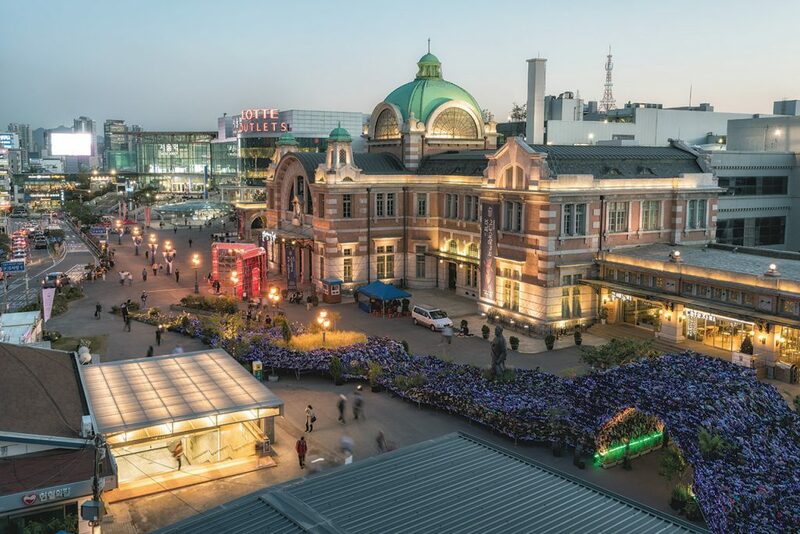 The Seoul Station revitalization is not the only project of its kind in the city. 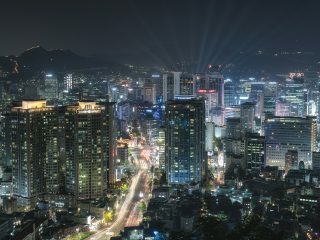 Particularly in the last ten years, the Seoul Metropolitan Government (SMG) has prioritized efforts to renew historical areas, invest in revitalization projects, build greener and more open spaces, and create a more connected city. In 2015, SMG announced 27 areas where it would invest revitalization efforts, including Mapo, Seocheon, Haebangchon and Namsan. The stated guiding philosophy of these initiatives is to put humans at the center of the city and to locally customize approaches to urban planning while maintaining existing traditions. “Urban regeneration … is a reinterpretation of already existing history, culture and human resources” said Jin Hee-sun, Director of the Urban Regeneration Office in Seoul. 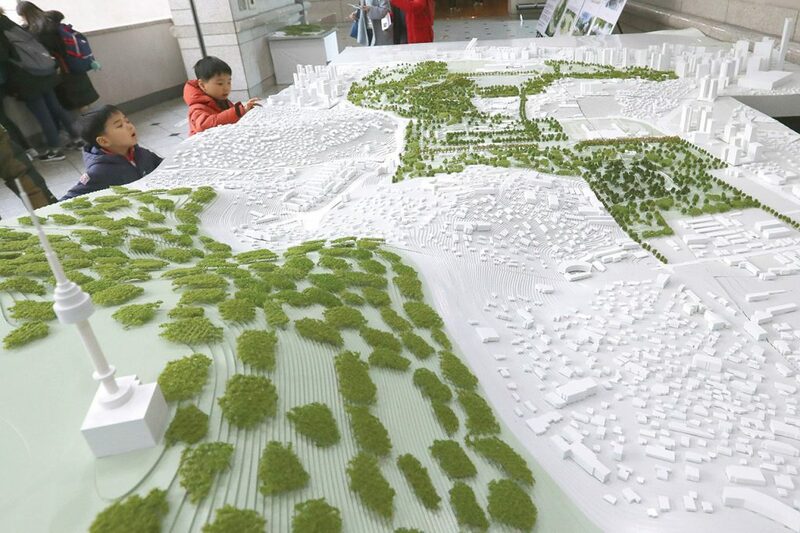 Yongsan Park, which will eventually take the place of the current United States military base near Neoksapyeong and Ichon stations, has been conceived as a mega park of over 243 hectares. Nakwon Shopping Center, part of the first generation of mixed use buildings in Seoul and known for its music and instrument stores, will also undergo a renewal. The city has made efforts to combat the controversy and risks of such projects through rent control policies, city-purchased buildings and community development initiatives. But there is no sign that rising rents and increasing disposable income will stop. The forces of gentrification may be difficult to combat, risking the loss of unique communities and their history. In the 1970s and 80s in Seoul, industrialization, efficiency and uniformity was the strategy of Korean development, leading to the giant apartment complexes and mass infrastructure that are iconic of Seoul’s skyline today. But a shift in the city’s approach to urban development has begun: one that values rebirth over demolition and tailored solutions over standardized strategies. However, the greatest challenge still remains: ensuring that the people of the city remain at the center. The question that only history will tell is whether the path of redevelopment will exclude the citizens who have made Seoul what it is today. But if one thing is certain, it is that Seoul is constantly changing, a reality that is symbolized in the giant overpass turned park that is Seoullo 7017 — not just another High Line. Fancy a stroll? 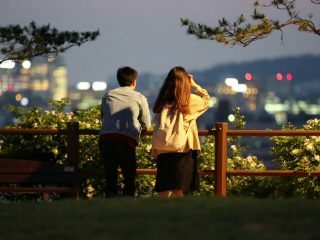 No matter what you think of Seoullo 7017 as an act of public policy, the city’s newest landmark does offer a fresh and rather pleasant space in which to stretch your legs. Though the park is worth a visit on its own merits, the pedestrian overpass also provides an opportunity to explore some interesting and under-appreciated neighborhoods. Here are some tips to get you started. Designed by Rotterdam-based architecture house MVRDV, Seoullo 7017 is itself one giant piece of public art. At its western entrance is Malli-dong Plaza with its “Yuseul: Malli-dong Reflecting Seoul,” a round sunken space covered with super-reflective stainless steel louvers. With 2,800 steps, it looks like an amphitheater, as which it sometimes functions. Another piece of public art is environmental artist Hwang Ji-hae’s “Shoes Tree.” The work, which has been likened to a “waterfall of shoes,” is made of over 30,000 worn-out shoes. Flower seeds have been planted in each shoe. The piece, a tribute to the old handmade shoe shops atop the nearby Yeomcheongyo Bridge, has already generated controversy, with some critics deriding it as an eyesore. SEOUL, on the other hand, will leave the art criticism to you, the dear reader. As one of Korea’s most popular tourist destinations, Namdaemun Market didn’t really need another reason to visit. That said, Seoullo 7017 offers an excuse to get re-acquainted with the city’s largest traditional market. This writer is particularly keen on two alleys: one lined with restaurants serving braised scabbard fish, or galchi jorim, and the other with shops serving homemade noodles, or kalguksu. If you’re looking for something really old-school, Eunho Siktang (T. 02-753-3263) has been serving oxtail soup, or kkori gomtang, for over eight decades. Passing over the train tracks leading into Seoul Station, the Yeomcheongyo Bridge is home to a row of old handmade shoe shops, some of which go back to the time of the Korean War. The alley’s once thriving artisans continue to produce high-quality footwear in the face of intense competition from cheaper imports from China and elsewhere. While visiting, drop into Café Moon (T. 02-393-3624). The delightfully vintage coffeeshop is the very definition of a hidden gem. One of Seoul’s grandest pieces of colonial architecture, Culture Station Seoul 284, a.k.a. old Seoul Station, was completed in 1925. The imposing structure, capped by a beautiful Byzantine dome, served as Seoul’s main train station until 2004. It’s now an art museum and cultural space. It is hosting “The Clock of the Time Traveler,” a series of screenings of films related to time and time travel. Among the films being shown are the “Back to the Future” trilogy, “Midnight in Paris,” “Eternal Sunshine of the Spotless Mind,” “Groundhog Day” and “Interstellar.” This writer would be amiss if he didn’t mention that two of his favorite films, “Blade Runner” and the anime version of “Ghost in the Shell,” are on the program, too. Officially named Jungnim-dong Catholic Church, Seoul’s oldest surviving Catholic church is still better known by its former name, Yakhyeon Catholic Church. The picturesque Gothic and Romanesque church, completed in 1892, sits atop a wooded hill overlooking the Namdaemun area. The church, which was restored following a 1998 fire, and its surroundings offer a tranquil refuge from the city below. Not far from the church is VERY KITCHEN (T. 02-312-0205). Run by star designer Joon Oh and housed in a century-old stone building, the trendy “kitchen lab” prepares dishes based on street foods from around the world. Malli-dong is a gritty, working class neighborhood to the west of Seoul Station. Low-rise homes and apartments climb the hills; roads run through the passes below. Urban redevelopment and gentrification may reshape the district in the years ahead. The Malli Market is a good place to experience the neighborhood’s vibe. Hidden in one of the market’s alleyways is Seongwoo Barbershop, a fascinating piece of the city’s history. Founded in 1927, the shop has been cutting hair the old-fashioned way for three generations. The place looks on the verge of collapsing, with broken windows held together by tape. The vintage charm, however, draws its loyal clientele, which includes politicians and business leaders.